Do you remember how "Out of Africa" begins? "I had a farm in Africa, at the foot of the Ngong Hills." This simple sentence seems to me a touching declaration of love to Africa and whatever Isak Dinesen lived and left there; it always comes to my mind when I read about Rachmaninov and how fond he was of Ivanovka, his family estate. Rachmaninoff belonged to a very old and noble family who, by the time he was born in 1873, had already come down in the world. The sole state his family kept in the late 19th century was Ivanovka (500 km far from Moscow); it was the composer's refuge between 1890 and 1917. It's hard to believe that Rachmaninov was a tyrant who exploited his workers- It doesn’t make any sense considering his extreme sensitivity or with those details that proved his integrity, like him resigning from an important position when a colleague was dismissed for being a Jewish. It doesn't fit either, from a musical point of view, with songs like Khristos voskres. However, not only was it hard to believe that Rachmaninov was a despot but also that his farmers (or any others for that matter) led a decent life, as we now know it. The revolution broke out and the composer went into exile in 1917; he lost everything and the country he so much loved had vanished. Since then, he no longer wrote any song; he wrote all his songs while he lived in Russia. This week’s song, Здесь хорошо (Zdes' khorosho, How nice is here) was written in April 1902, in a sweet moment in the composer's life: he had overcome a creative block and had just married his cousin Natalia Sarina. Zdes' khorosho is n. 7 from Twelve Romances, op. 21, a beautiful song that talks about the bond between man, nature and God. It’s also a love song; One of the things I like the most is the balance between contemplation and passion that Rachmaninov accomplishes. 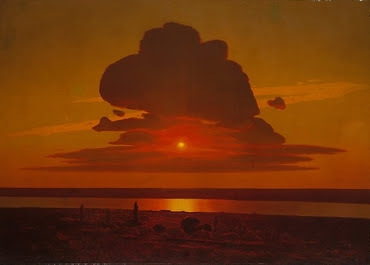 The poem, by the Countess Glafira Adolfovna Einerling, a contemporary writer of the composer who wrote under the pseudonym of Galina, simply describes a sunset. I don't know if the landscape portrayed is similar to what Rachmaninov could see from his home but no doubt he felt it part of his own; he even changed the beginning of the poem so he said that the nice place was "here". Zdes' khorosho is a song full of lyricism, seemingly simple but demanding for the singer (please pay attention to the pianissimo at the last verse, which seems to arise from nowhere), with an exquisite accompaniment. Some scholars think that the true essence of Rachmaninov is found in songs like that, rather than in his athletic piano concerts. In 1963, the Russian composer Vladimir Michailovich Jurowski (father and grandfather of conductors) orchestrated ten songs by Rachmaninov, including Zdes' khorosho, and there is a later orchestration of this song by Michael Rot. You know that I usually find it difficult to renounce the original piano versions, especially when the composer didn't orchestrated them, but I recommend you to listen to Anna Netrebko singing this song with the Mariinsky Theatre Orchestra conducted by Valery Gergiev. You might wonder why I don't share this version here, there are two reasons: first, I can’t do without that beautiful piano; two, I chose my version months ago (something that lately happens quite often). I said before that Zdes' khorosho is between contemplation and passion; Most of singers enhance the most contemplative perspective, that's the case of the lovely performance by Anna Netrebko. Others sing the most passionate version, like the one we’re listening today. Its tempo is faster than usual, it lasts about a minute and a half; maybe it would surprise you if you're used to slower versions. I hope you enjoy this song as much as me; I think this performance by Nicolai Gedda and Gerald Moore, recorded live in 1966, is wonderful. Zdes' tol'ko Bog da ja. As always we have a Russian song, I add the original text in Cyrillic.